@Disney @Disney/Pixar @Hasbro, Inc. All Right Reserved. Jenga® Pokonobe Associated. All Rights Reserved. With the opening of Toy Story Land this summer, guests are in for a rollicking good time as Disney’s Hollywood Studios®Toy Story toys. 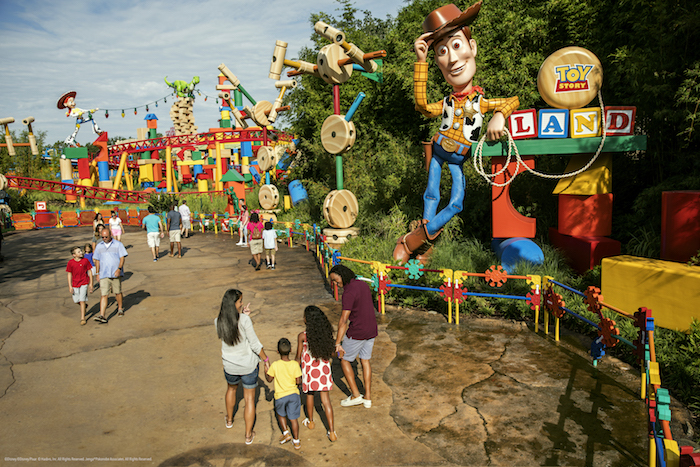 Inspired by Pixar Animation Studios’ Toy Story films, Woody, Jessie, Buzz Lightyear, Slinky Dog, Green Army Men and other fun-loving Toy Story characters come to life in the outdoor setting of Andy’s backyard. A world of toys surrounds guests: giant building blocks, Tinkertoys, yo-yos, board-game pieces, dominoes, Scrabble tiles, and even a giant roller coaster set. The entire land encourages the best playtime ever. This multi-launch, family-friendly roller coaster careens around bends and “catches air” over camelback humps as it runs across the 11-acre land. 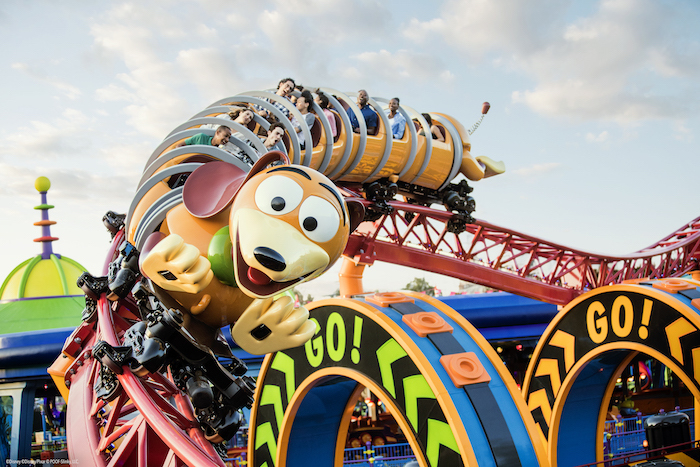 Be inside Slinky Dog’s coils as the lovable pooch twists and turns around the track. The attraction’s ride vehicles are spring-tailed spinoffs of Slinky, the iconic American toy from the 1940s. Riders of all ages delight as Slinky Dog bends and twists his coils around curves, over hills and down drops in the Slinky-est coaster ever. In each 18-passenger coaster train, riders zip around and above Toy Story Land, catching great vistas of all the new land has to offer. In a first for a Disney coaster, Slinky Dog Dash features a second launch at its midpoint as riders experience cool sound effects and spinning lights, darting through a series of rings on their way to the attraction’s finale featuring Wheezy, the squeaky penguin from the Toy Story films. 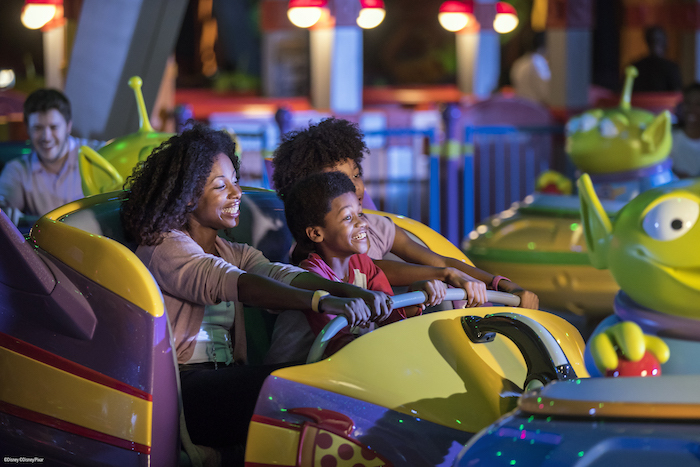 Alien Swirling Saucers immerses guests in the playful world of Andy’s imagination as adorable little green Aliens from Pixar Animation Studios’ Toy Story swirl about in toy rocket ships with guests in tow, while “The Claw” hangs overhead. Two sets of 11 saucer/rocket-ship pairings spin guests through a multi-colored galaxy to a raucous, energetic musical beat. While Andy’s away, the toys will play! Toy Story Midway Mania! – one of the most popular attractions at Disney’s Hollywood Studios – receives a colorful all-new entrance. Evoking the fun in store, the entrance is actually the box Andy’s Toy Story Mania! game came in. Recently updated with a third track, the attraction allows even more guests to experience the carnival playset action, using virtual objects from baseballs to cream pies to hit targets in a variety of whimsical, fast-paced scenarios. To the highest scorer go the bragging rights!